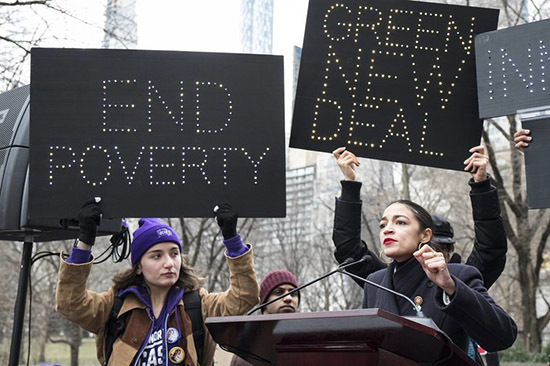 Is the Green New Deal (GND) a liberal pipe dream, or is it an opening for an economically viable, bipartisan climate change solution? The program put forward by Rep. Alexandria Ocasio-Cortez (D-N.Y.) and her team reimagines the U.S. as a nation with no carbon emissions, full employment, a fair and equal economy, and justice for all. This GND proposal pairs massive government spending with quantitative easing by the Federal Reserve to achieve these aims. Since we can just print money, the argument goes, it would cost nothing. Not so fast. Whereas deficit spending and a Fed stimulus package are good policies in a deep recession, we are now near full employment. For a Green New Deal to work now, we will need to pay for any federal investment with higher taxes. Moreover, that investment should be rolled out gradually. We’ve been running near constant deficits since 1960 (exceptions being 1969 and the second term of the Clinton presidency). What enables us to run these constant deficits is that someone is lending the government the money, as if continually refilling a cookie jar. The primary lenders are foreign countries (and citizens) eager to hold onto large sums of dollars, a currency widely perceived to be stable and enduring. If we print money with abandon, however, inflation will catch up with us, the perception that U.S. currency is stable will disappear, and the cookie jar will stop refilling. A steady and slow buildup of spending would allow more time to select and evaluate green infrastructure options that have a reasonable chance of working. The climate problem is not going to be solved in five or 10 years. We need the right size of government spending for the long term. If the government builds expensive green infrastructure but people prefer their brown activities, all the investment in the world won’t solve climate change. Taking this path is tantamount to digging holes and filling them in. It may create a lot of jobs, but if most everyone already has a job, the new jobs will just crowd out other productive activities. What’s needed is to have these new jobs crowd out dirty jobs, specifically. Toward that end, green infrastructure investment should favor hiring on the basis of needed workers rather than simply providing job slots for the available workforce. Raising taxes on wages and investment income to fund Federal projects can lead to less investment and employment. A higher minimum wage requirement—unrelated to green investment itself—throughout the entire economy, along with a more progressive income tax structure, can make the economy fairer. Of course, we also need to include and protect neglected minority communities. If we want to bundle equity and inclusiveness into the GND slogan, that’s fine, but they are completely or largely separate policy instruments than those directed toward carbon emission reduction. Finally, we can increase the chance of success by not only making green activities more attractive, but brown activities less so. Thus, the GND needs to be paired with carbon pricing. Carbon pricing should be seen as the main component of reducing greenhouse gas emissions, and smart government investment in green infrastructure as a useful complementary measure, not the other way around. The bottom line is that the Green New Deal could work, but only under the three aforementioned guiding principles: carbon pricing, smart infrastructure investment, and a more just economic system. If all that’s in the GND, then count me in. John Reilly is co-director of the MIT Joint Program on the Science and Policy of Global Change.